Kalizo Fishing Camp has entered a new era. 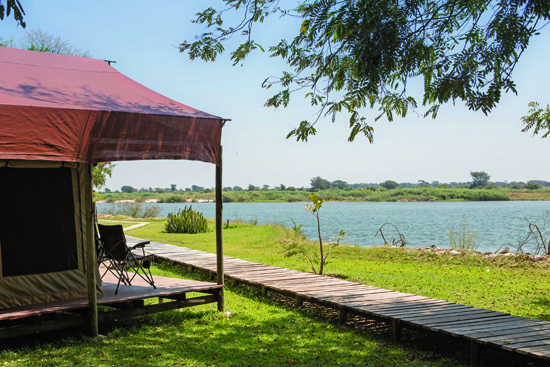 This well-known fishing and birding destination in the eastern Zambezi Region, 38 km east of Katima Mulilo, is set to become a firm favourite with its old clients once again. 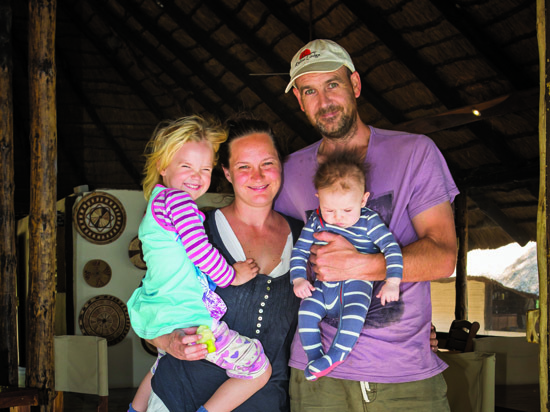 In 2012, Johannesburg-born Tony Farrow and his Natalian wife Lara started thinking about returning to Southern Africa from Australia to raise their young family closer to nature. One day their friend Johan Griffioen called to say Kalizo was on the market and that he and his wife Cherie had gone there to have a look. Tony and Lara were invited to join them in the business and their future seemed to fall into place in an instant. What probably clinched the deal was that Johan’s wife Cherie is also Lara’s mother! By December 2012 they had all arrived at their new home to begin a new era for Kalizo. 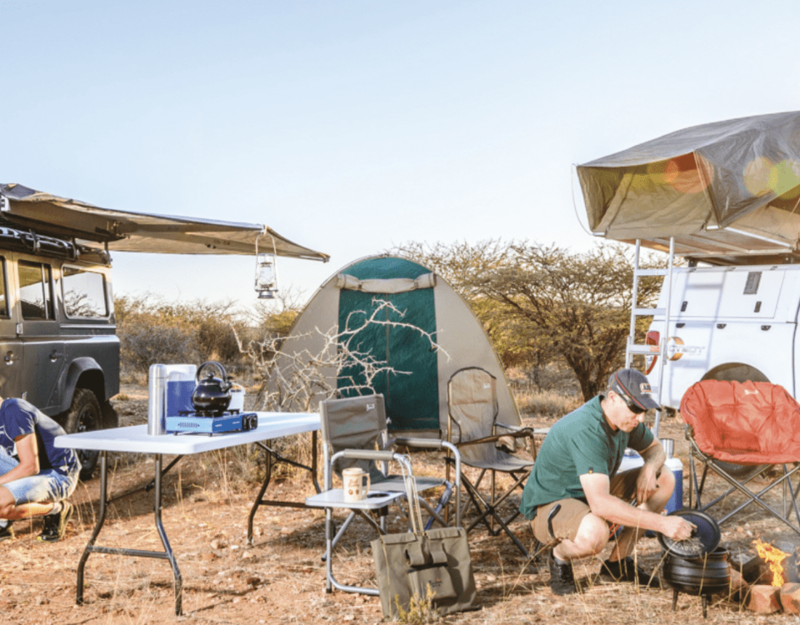 For many years Kalizo has been a favourite destination amongst tiger-fishermen as well as for the birding community – both ‘twitchers’ and bird photographers. But in the past, more often than not, the partners and family of these enthusiasts hadn’t joined their spouses on the trips. Now, however, due to the recent improvements to the accommodation, campsites, catering and recreational facilities, families are encouraged to come and enjoy the relaxing atmosphere and amenities. There’s a shady garden to relax in, a beautiful swimming pool, and Tony is planning to enlarge the children’s play area to also entertain the little ones. New tents on boardwalks are situated next to the river to maximise the view. Tony is also something of a foodie and takes great pride in using fresh produce from his vegetable garden to create something special each night. Kalizo is well known for its superb fishing opportunities, and practises a catch-and-release system. August, when the river is pretty much at its lowest, is an excellent time of year for catching tiger-fish and bream. On the birding front, the Africa skimmer is a sought-after species especially for South African birders and photographers, as they have been locally extinct in South Africa since the late 1940s. But the real draw card for many is a very special event that begins late in August. Every year between 21 and 26 August, the southern carmine bee-eaters arrive in their thousands from further up north in central Africa. Kalizo is thought to host one of the largest breeding colonies for these birds in Southern Africa, just one kilometre from camp, and often hosts as many as 4,000 birds or more. They arrive in small flocks and by the beginning of September the colony is alive with these spectacular birds, mating and squabbling as they seek out their partners and nest sites. Usually nesting in the riverbanks, this year the colony is found mainly on flat ground on top of the bank. Great care must be taken to keep well away from the nests when visiting, as they are not always easily visible and are extremely vulnerable to caving in and smothering the birds and/or the chicks. Early in the season you can witness the aerial mating displays, with birds twirling each other around like winged seedpods, their beaks locked before falling to earth. Sometimes they hit the ground in a puff of dust, but mostly they release before impact. Later on in October you will see the adults bringing food to the nests. There are few things more rewarding for photographers and twitchers than watching the fascinating aerial displays of these beautiful birds. A distinctive twittering sound continuously fills the air, rising to a crescendo as the birds take off as one when disturbed. Raptors occasionally try to catch the birds in flight, and later on the nestlings are vulnerable to being predated on by snakes and water monitors. By mid-December when the chicks have left the nests the show is almost over, and by March they are preparing to leave Southern Africa once again. After such intense bird-watching, it’s great to return to the comfortable lodge to while away the rest of the day or try some of the other activities on offer. Happily, carmine bee-eater watching can be addictive, so you’re bound to return here next year! My favourite photographic destination ! Not so just because of the Carmines and the other birdlife, but because of the great people Tony,Lara,Cherie and Johan are.